Tropical Christmas door decorations create a warm and unique holiday welcome for friends and family. Here you’ll find a variety of tropical, floral, and beach themed holiday decoration ideas for your door, porch, and walkway. Add tropical silk flowers to plain Christmas wreath, such as poinsettias, hibiscus, plumeria, bird of paradise blooms, and exotic silk orchids. Add an extravagant bow with a tropical print or bold exotic color. Hang a beach themed Christmas wreath with seashells, starfish, and pearls. Accent this wreath with a nautical rope or net instead of a bow. Decorate a plain wreath with your favorite tropical themed ornaments, such as rainforest animals, tropical and surfing Santas, exotic birds (parrots, peacocks, and toucans), or ocean animals ornaments (tropical fish, seahorses, sea turtles, and starfish). Christmas Garland – Surround your door with lighted Christmas garland. Add exotic silk flowers or tropical themed ornaments for a unique door decoration. 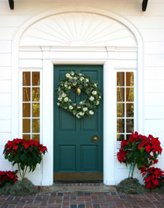 Tropical Christmas Flowers – Add colorful poinsettia flowers next to your door and on your porch. If you live in a cold climate, use silk poinsettia plants. Create a unique tropical flower container garden with poinsettia plants as the focal point. Add Additional Space – Add a small table or plant stand next to your door. This is an easy way to create additional space to display tropical Christmas flowers and decorations. Create a Unique Display – Create your own unique display. Add a bow or ornament to the door knob. Display pictures of your tropical vacation or wedding Christmas photo frames. Decorate the Path or Walkway Leading to Your Front Door – Line the path with colorful Christmas lights and tropical Christmas light decorations.